Guide in 'Disciples of War' published by Caimie Tsukino, Apr 11, 2015. You are expected to lead the way in dungeons. This is so that you are the first person enemies see. When a set of monsters are linked together, the first person to attack or be spotted by one of them will gain some enmity on all of them. You are expected to determine how much to pull at once. Usually, you will only pull monsters that are linked to each other. You are expected to position the fight. Sometimes, you can fight enemies where they are. Sometimes, you will need to pull them away from other enemies or patrolling monsters to make sure your party isn't overwhelmed. You are expected to keep enemy AOEs (Area Of Effect—the orange cones and circles of pain) away from the rest of your party. You are expected to dodge any damage you don't have to take. So, when you see the orange AOE zone, move out of it! Then, as soon as it disappears, move back to the same spot you were in before. This keeps the monster from moving or turning to follow you, which makes attacking easier for Pugilists and Lancers. Next, you want to build enmity on your primary target—the one you Tomahawked, and the one the rest of the party should be focusing their attacks on. Your enmity-building combo is Heavy Swing > Skull Sunder (and after level 30, > Butcher's Block). These skills must be used in order, or you won't get the enmity bonus. Every 2 or 3 combos, you can use Overpower again to make sure you're not losing enmity on the other enemies. You might also use Flash if you have it (you can cross-class it if you have Gladiator to level 8). TP management (and, if you use Flash, MP management) can be a major issue in longer or more hectic fights, so you may want to minimize Overpower use, and use this next technique for enmity maintenance instead. Later on, and on tougher fights, Overpowering occasionally will not be enough. I recommend switching targets between attacks. When you switch targets, you can see your party members' enmity bars and determine if you need to attack this enemy again yet. I will explain that in the UI section below. If you switch targets and someone else is about to pull enmity off you, use the next part of your combo on that enemy. If you switch targets and no one is about to pull enmity off you, switch to the next target. On most boss fights, there will be one boss monster in the beginning of the fight. When there is only one target, you do not need to use Overpower. Just use Tomahawk, turn the boss around, and use your Heavy Swing > Skull Sunder ( > Butcher's Block) combo. If adds (extra enemies) show up, you may need to "pick them up." You will do this by switching targets and using Tomahawk or your enmity combo or, if there are several clumped up, Overpower. Sometimes, however, the boss will have dangerous frontal swing or cone attacks. In those cases, usually the DPS will need to kill the adds, because if you run toward them, you will turn the boss toward your allies. Always be aware of your positioning! You have a number of marks available to you to help your party know what you're doing. Most of the time, the most useful of these will be the marks 1, 2, and 3 (there's also a 4, but if there are four enemies and 1-3 are marked, people can guess the unmarked one goes last). If you have no particular kill order in mind, it's sufficient to just mark 1. You can set these to a hotbar or, if you're on console or controller, an expanded crossbar easily from the Signs section of the menu. If you make a habit of marking your target #1 and Tomahawking it first, most folks will know to focus on that enemy first. And if enemies need to die in a specific order—say, the bees in The Sunken Temple of Qarn needing to die first—this will help keep everybody on track. There are three parts of the UI that will be invaluable for you as a tank. The first is the enemy cast bar, circled in green. The one on top of Titan's health bar in the picture is your targeted enemy's cast bar. The one just above "FOCUS TARGET" is your focus target's cast bar (focus targets are great, you guys, put them someplace you'll see them and use them!). This will tell you what the enemy is doing. Sometimes, an enemy will begin to cast something nasty, and you will be able to interrupt them by using Brutal Swing. Other times, this cast bar will simply show you how much time you have to move out of an orange AOE zone before you are hit by it. If you are in the zone when this cast bar fills, you will be hit. If you are not in the zone when the cast bar fills, you will not be hit. The enemy's attack animation does not matter; only the cast bar does. The second thing to note is your party's enmity bars. The tank's enmity bar is circled here. It is full, and says A next to it. That means this person has enmity on the targeted enemy. The numbers 2, 3, and 4 next to other party members' icons show who of those three has the most to the least hate. The bars next to the number show you how close they are to gaining enmity. As you can see, the Conjurer has middling hate. The Bard (2) and Lancer (3) have much more. Once Rowan's white bar fills, he will take enmity and become A. You need to make sure that doesn't happen. So if you switch targets and see an ally's white bar is as full as Rowan's or Meko's, or even as full as the Conjurer's if it's a high-damage DPS whose bar is getting up there, you should hit that enemy at least once! ^ An example of an enemy you don't need to hit again for aggro. Unless this is your main target and all secondary targets are looking good like this too, cycle to the next and check aggro! The third thing is the enemy list, circled here. It appears under the party list and is particularly important if you lose enmity to an ally. Every enemy you have engaged will be on this list. This means any living enemy you have attacked will be on the list. If you were the first person to attack or be seen by a group of enemies, all those enemies will be on this list too. The brown highlight tells you which of those enemies you currently have targeted. The red square symbol means that you have the enmity of the enemy listed next to it. An orange upside-down triangle means you almost have enmity. The yellow triangle means you have some hate, but not a lot. The green circle means you have very little hate. As a tank, you want all the enemies to have red squares next to their names. If you lose enmity to a party member, you will see the red square change—probably to an orange upside-down triangle. When this happens, click on that enemy in this list. This will make that enemy your target. Then you can use whatever part of your enmity combo is up next (for example, Skull Sunder if you just used Heavy Swing on somebody) if you are nearby, or if it is running out of range, Tomahawk. Keep attacking until your party's white enmity bars show that no one else is in danger of taking enmity again. Your Job as a Tank - Keep That Aggro! Your aggro bar / enmity bar is something you must keep an eye on as a tank (If you don't know what it is, please see praysolace's Marauder guide above, see the section about "Enmity Bar"). If you're the only tank in your party, your aggro bar should ALWAYS be higher than everyone else in your party. This ensures that all threats in the area will be targeting you instead of any other party members. And when you go play DPS or healer classes in the future after your tanking experience, you will find that the aggro bar is just as useful. If you’re a DPS, and your aggro is very close to the tank, you might want to stop attacking for a bit, or start using skills like Quelling Shots to reduce aggro. If you’re a healer, and your aggro is very close to the tank, you might want to slow down a bit on heals, especially reduce the use of Medica or Medica II. If you’re the tank, and your aggro is barely above another person, you want to go through your “Fast Blade -> Savage Blade -> Rage of Halone” combo (see below) as fast as possible, generate more aggro, and rectify the problem. 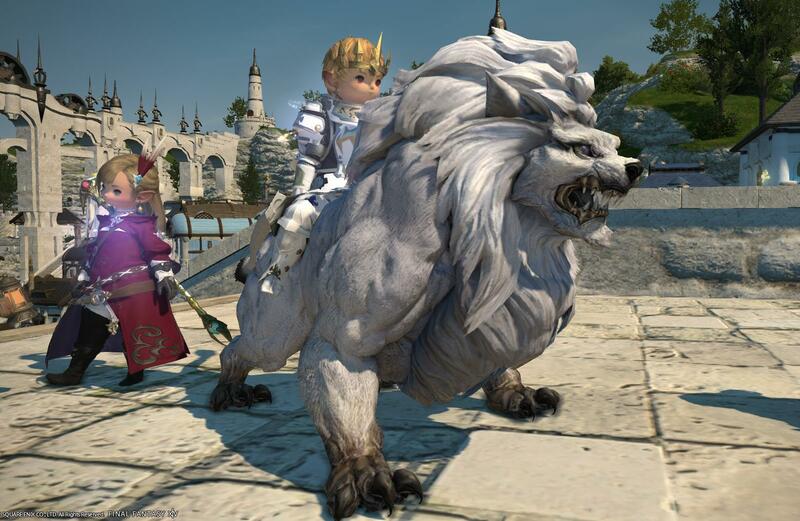 Do Your Class Quests, Please! As a tank, I cannot stress this enough! Every 5 levels, please do your class quest to get that extra tanking skill! E.g. Shield Lob from level 15 class quest (similarly for Marauder level 15's Tomahawk), Sword Oath from level 30 class quest and Shield Oath at level 40 class quest. These skills are extremely important for the dungeons in the next 5 levels of yours. So you really wanna grab them asap before you proceed any further with dungeons. Sword Oath increase potency of auto-attacks by 50. Do not underestimate that 50 potency. It is actually a big deal. Shield Oath reduces damage received by 20% while lowering own attacking power by 20%, and increasing enmity (multiples enmity by 2x). Shield Oath is your ultimate tanking buff that will help you become more durable and greatly increases your aggro. The two oaths are mutually exclusive. They cannot be used together.If you're main-tanking, it's recommended that you use Shield Oath since it gives more aggro. If you're off-tanking (so basically just DPS-ing with your PLD), then you should use Sword Oath to increase damage output. But remember to pop back Shield Oath when you need to grab adds for the party. Some main-tanks prefer to use Shield Oath instead. This is OK if the PLD has gone for a high Strength build, and provides enough damage to keep that aggro. However, unlike WAR, high Strength PLD does not translate that damage into HP recovery. Thus, high Strength PLD (with much less Vitality) may lose a lot of tanking powers. These 3 are your most basic primary GCD (Global Cooldown) skills that can be chained in a combo. Rage of Halone is learned at level 26. When performed in a combo, it generates a huge amount of enmity on a single target. Please notice that you can actually perform each of the skills within the combo on 3 different targets, and the combo will still be valid. As long as you perform them in the proper sequence, the skills will be chained together. i.e. Fast Blade on Target 1, Savage Blade on Target 2, Halone on Target 3… etc. When performed right after Fast Blade, this skill will recover you 80 MP. This skill generates very little enmity, and should only be used for MP recovery. Shield Lob is a ranged attack that generates some decent enmity. It is particularly useful at the beginning of a pull to establish the initial aggro on the 1st target. This skill will drain your TP if overused, and does not provide as much enmity as your Halone combo. This is a very useful stun skill to intercept a target if it's casting something dangerous. It does not generate much enmity and will drain your TP if overused. Shield Swipe is a damage-generating skill that does not provide much enmity. However, it only cost 40 TP for the large amount of damage it provides, making it a valuable tool when your TP is low. This skill can only be used right after a successful block. Thus, activating "Bulwark" will allow this skill to be frequently available. Flash is your only AoE skill until you learn Circle of Scorn at level 50. It does zero damage to enemies. But it generates a decent amount of enmity in a large area, and also blinds the target, rendering the target unable to attack a ranged DPS or healer who is standing afar. It's one of the most-used buttons of a GLA/PLD in dungeons for managing multiple targets. If you're not using Flash much, you're not doing it right. The only time you don't touch this button is when there's only a single target. This is a PLD's only AoE skill that can do damage. It starts with 100 potency, and then it has a Damage over Time (DoT) effect of 30 potency for 15 sec. It is a very reliable skill to establish initial aggro on multiple targets when used together with Flash. When managing multiple targets, use this as often as you can. This is a decent damage-generating skill that cost no TP/MP. Its damage potency depends on your current HP. The higher your HP, the greater the potency. Since it is outside your GCD (off-GCD skill), this skill can be fitted between your GCD skills to supplement your damage and aggro. In addition, this skill has silencing effect, and can be used to intercept some target's dangerous spells. This skill increases damage up to 30%. It only lasts for a very short time when you're at lower levels. But it is still part of your bread and butter for aggro boosting. NEVER be stingy about it. Pop it whenever it is available. Do not try to save it. At level 28, its duration will be extended, making it even more powerful. This is your Go-To skill to reduce incoming damage. Just like Fight or Flight, NEVER be stingy about using it. Pop it before every fight. It has a pretty fast cooldown, so it's going to be available very frequently. At lower levels Rampart reduces damage by 10%. After reaching level 14, Rampart reduces damage by 20%. It's a button that you should use at the beginning of almost every engagement. This is a great alternative when Rampart is on cooldown. It has a very similar effect to Rampart, except Foresight only works against physical attacks and has a longer cooldown, so it cannot be used as often. Converts 25% of damage dealt into HP recovery. Even though a PLD does not do as much damage as a WAR to make this skill as effective, it is still a very valuable tool in HP recovery. Imagine your PLD doing attacks of about 160 damage (quite low), it will still result in the recovery of 40 HP per hit. Imagine your enemy dealing about 650 damage on you per hit, and you recovery 40 from each attack. It's equal to 40/650 = 6% damage mitigation. It's really not bad! In reality, some PLD attacks can definitely do more damage than 160, so Bloodbath definitely has its functions. This skill delivers an attack with a potency of 200. It can only be executed when target's HP is below 20%. If delivered as the killing blow, up to 20% of your maximum HP will be restored. This is a great skill for a GLA/PLD because GLA/PLD doesn't have too many skills that can do good damage. Increase block rate by 60% for 15 sec. 60% is a very big deal. When both Rampart & Foresight are on cooldown, I turn to this skill to reduce incoming damage. Since Bulwark greatly increases block, and block is the key to use Shield Swipe (a strong DPS skill that requires very little TP), Bulwark is a combination of defensive, offensive & TP-conserving skills. Increase HP recovery via magic healing by 30% for 20 sec. When Rampart, Foresight, Bloodbath, Bulwark are all on cooldown, I turn to this skill. Yes, it doesn't mitigate any damage, so you lose a big chunk of HP every time the enemy attacks you, but you also recover HP much faster when the healer heals you. I like to use this skill together with Awareness (see below). Awareness nullifies the chance of suffering crit damage for 15 sec. At level 44, the duration of this skill becomes 25 sec. This is a great skill to be paired with Convalescence because Convalescence does not result in actual damage mitigation. If a crit attack happens, you will suffer a lot of HP loss. So having Awareness to back it up is always a nice thing to do. Reduces incoming damage for 30% for 10 sec. At level 48, this skill reduces incoming damage by 40%. You practically halved the incoming damage. This is your 2nd strongest defensive buff. It is extremely effective against expected spikes of incoming damage. Rendering yourself invincible for 10 sec (a.k.a. God-mode!). This skill is what makes PLD superior to WAR in some special situations. However, there is a 1 to 2 sec time delay when you activate this skill. So don't wait till your HP is as low as 200 to use it. You'll just die. When your HP is around 1K to 2K, and you're not expecting the healer to recover you to full health quick enough, use it. So that healer may have a chance to heal you back to full health. Or if you're expecting a lot of damage soon from a large pull of many mobs, use it. Immediately cures Bind and Heavy, while preventing knockback and draw-in effects. This skill does not increase your defense powers, but is very useful in many situations. e.g. 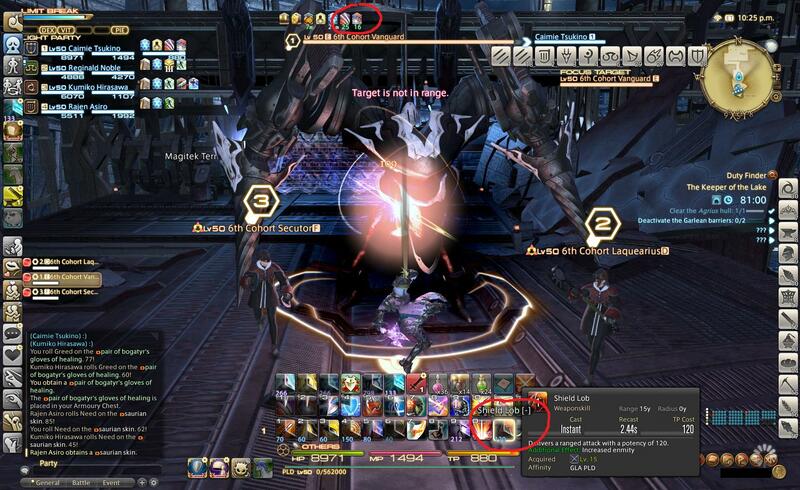 in Shiva Extreme, during the laser-tag phase where she knocks back the tagged target with a laser, a good main-tank will have his finger on top of this button just in case he/she gets tagged. Main-tank is going to be standing at the arena's edge. If he/she gets knocked back, he/she will be frozen at the edge of the arena. Tempered Will can completely prevent this from happening. Of course, if tagged, the main-tank can alternatively run towards to backside of Shiva so that when he/she gets knocked back, he/she won't hit the arena wall, but this will result in quite some chaos in the run due to sudden changes of positions. Another e.g. is when you're solo-traveling at the Amaljaa, Sylph or Kobold tribes area where they love to cast slow on you. Then this skill can immediately shake off the pain. You will have to get off your mount though, and you won't be able to get back on your mount until you have left the area. But sprinting without slow is still faster than riding with slow. So it's still a valid thing to do to get off the mount and pop this skill, and then flee with sprint. If you get hit by a morbol, yes, a morbol, you'll be in a lot trouble from the slow, paralyze etc. Pop a Spine Drop will immediately cure your paralyze, and then use Tempered Will to clear off the slow, and you can right away go back to action with the rest of the debuffs which are not as bad. Take all physical damage intended for another party member for 12 seconds. Most PLDs forget that they have this skill. It's actually a very useful skill, but under-used. E.g if you're off-tanking near the main-tank, and you see the main-tank suffering greatly and is about to die, click on the main-tank, and then pop this. The main-tank will immediately be relieved from the danger, potentially saving the party from a wipe. E.g. in a situation where you're out of Flashes & Provoke, and yet a party member is pulling mobs off you, give that member Cover. He/she will continuously be attacked by the mobs, but all the injuries will go to you instead. Creates a barrier equivalent to 10% of the target's HP. 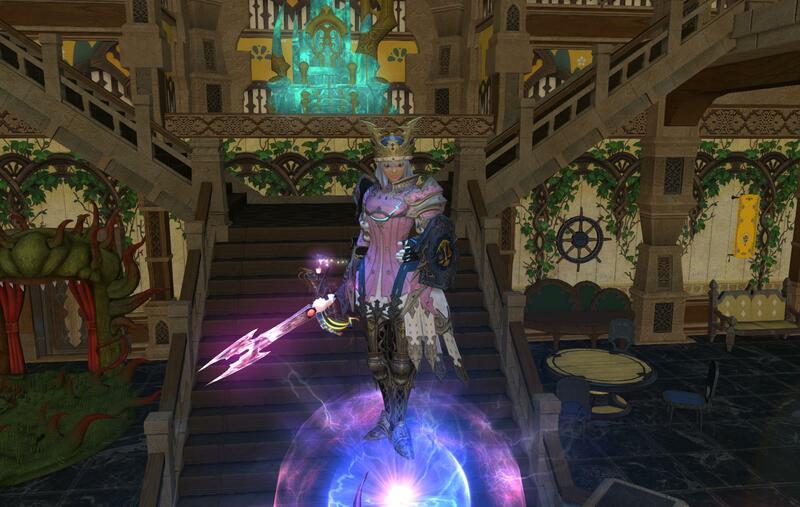 Some PLD prefer to have this Cross Class Skill equipped to help mitigate own damage or a party member's damage. It is indeed a valid skill. However, don't try to substitute a White Mage's Stoneskin before the fight though. White Mages'/ Conjurers' Stoneskin is stronger - equivalent to 18% of the target's HP. *Disclaimer: The site is outdated for Flash, Circle of Scorn and Shield Oath. These skills have been buffed in recent patches. They now generate more enmity or multiple more enmity than what is listed on the enmity table above. "It's better to use it and not need it, than need it and not use it." - GeekMatt. This rule applies to Hallowed Ground as well. If you think the danger is present. Don't hesitate to click that button (unless you planned to use it at a specific time where you expected the most incoming damage). This is especially true for large pulls. You gotta pop that Hallowed Ground before your HP is too low. If you’re already so confident in tanking that you feel like this procedure is a burden, then just do anything you like. This procedure is not something that “has to be done”. Some people can skip steps, and do just fine. But if you’re not doing that perfectly yet, or if you’re looking for room for improvement, then I highly recommend you go through this check list to see if you’re missing something. (1) Mark the 3 mobs – This ensures all DPS’s will all be focusing on the mob#1 that you’re engaging. Thus, avoiding DPS’s pulling off mob#2 or #3 away from you. You can manually mark them (Shift M if you’re on PC), or you can use macro to easily mark all 3 mobs (see below). Even if you get lazy, you should still at least mark mob#1 to avoid confusion. (2) Pop “Fight or Flight” and “Rampart” – Fight or Flight increases your damage, thus help maintaining better aggro. This is particularly important when you’re a low level GLA where you could easily lose aggro to DPS’s or healer. Rampart decrease your injury, thus help reduce heals from the healer, which in turn reduces aggro generated by the healer, and helps you to maintain aggro better. If Rampart is on cooldown, use Foresight or Bulwark instead. (3) Run towards mob#1 and Shield Lob it – This move generates your primary aggro on the first mob, so that you’re ahead in aggro above everyone else on this mob. - Run towards your #1 and Shield Lob it while Fight or Flight and Rampart are active. (4) Circle of Scorn & Flash x1 or x2 – Your Shield Lob would have attracted all 3 mobs towards you. This allows you to use Circle of Scorn or Flash to establish aggro on them all. Circle of Scorn is a level 50 skill, so before you have it, you’ll have to just make do with Flash alone. When you Flash once or twice on all 3 mobs, you immediately establish some good aggro on #2 and #3. If you don’t do this, #2 & #3 will immediately be attracted to the healer when the healer does his first heal move on you. That will make all 3 mobs separated (because #1 is still attracted to you), which will create a big mess, making your job difficult. (5) Begin your “Fast Blade -> Savage Blade -> Rage of Halone” combo on mob#1 – GLA/PLD’s strongest aggro against a single target is generated by “Rage of Halone” performed in combo. Rage of Halone is learned at level 26. So before level 26, you will have to make do with just “Fast Blade + Savage Blade” (and it’s difficult to keep aggro with this, I know). (6) Flash at least ONCE every 1 or 2 Fast Blade combos to keep all mobs under your control. And rotate the Fast Blade combo on different mobs as you see fit. If you’re on PC, you can switch target by the “tab” key on your keyboard. You can break down your Fast Blade combo by attacking 1 mob with Fast Blade, and Savage Blade on another, and Rage of Halone on another (so… tab, Fast Blade, tab, Savage Blade, tab, Rage of Halone etc.). This way, you can monitor the aggro bar on each mob easily, and see which mob needs more attention. When you see a particular mob needs more of your aggro, just land your combo-ed Rage of Halone on that mob, or simply engage that mob more often. Then Flash again to keep the others sticking onto you. (7) Whenever available, weave in “Spirits Within” into your rotation between GCD skills to further your aggro on a specific target. Note: The potency of Spirits Within depends on HP. The higher the HP, the greater its potency. (8) When mob#1 is about to die, it’s OK to let go with aggro on him. Save your moves on mob#2 to establish better aggro before the DPS start working on #2. NOTE: “Shield Swipe” is good in damage powers, but it is not good in gaining aggro. Do not use this if you’re trying to establish aggro at the beginning of an engagement. “Shield Bash” is a “stun” skill that is very useful in many ways (like stopping a particular target from casting something dangerous or to temporarily halt a few opponents during a big pull), but it’s not a good skill in gaining aggro either, and it depletes your TP very quickly. Put this into a macro, and drag the button onto your hotbar. Forever make it an easy job to mark all 3 mobs. (1) When a mob runs off from you to a party member that generates a lot of aggro, and you have big troubles getting it back, use Provoke on the mob to get your own aggro on top of that party member. After provoke you will need to immediately use Shield Lob, Flash or Circle of Scorn to keep that aggro before the party member is ahead of you again. (2) In a full party trial, most of the times main-tank and off-tank need to switch roles or switch targets at some point. Provoke is ABSOLUTELY NECESSARY to do this. This skill allows one tank to easily pull a target away from another tank. And once again, right after Provoke, the tank must quickly establish further aggro on the target to keep it, or the target will immediate get pulled away by another person because that +1 aggro will only last for 1 or 2 seconds before someone will get ahead of you again. Concerning attribute points distribution, “Vitality” and “Strength” are a no-brainer. All other stats are almost meaningless to a tank. Vitality affects your HP, thus affects your ability to tank damage. Strength affects your damage, thus affects your aggro (for a Warrior, damage also equals HP recovery from Bloodbath, Inner Beast and Vengeance, so strength is even more important). Stronger strength also directly gives rise to stronger “Block Strength”, which can help reduce a lot of damage when “Bulwark” (increase block rate by 60%) is active. In general, tanking class should always have some good Vitality points to ensure sufficient tanking powers. The amount of Strength may vary between individuals depending on the need. At lower levels, Gladiator has very limited skills to generate aggro. Thus, some extra Strength can help with aggro maintenance, but this will in turn sacrifice some tankability. 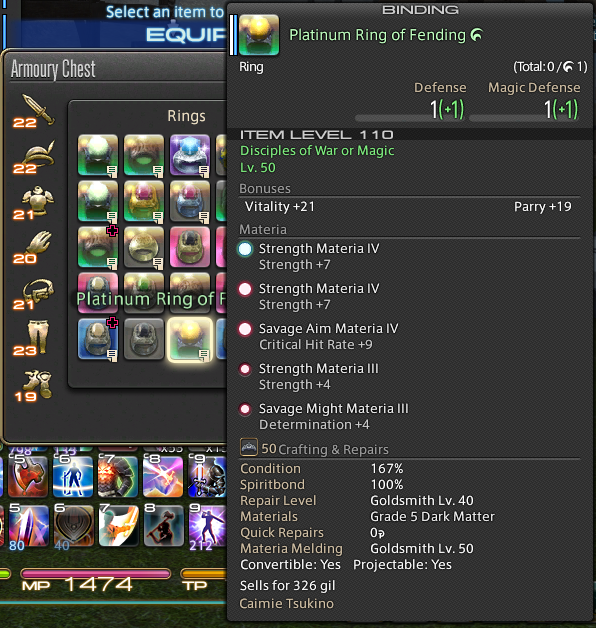 If you’re a crafter or if you know a crafter, you can potentially meld some cheap Tier I Strength materia onto your accessories (jewellery) to help achieve higher Strength, so that you can put all your attribute points onto Vitality but still having that extra aggro. Otherwise, a few more points on Strength really can’t hurt. At higher levels or end-game, Vitality becomes important. This is because you will have collected all your aggro-maintenance skills by then, which should be sufficient for keeping aggro in most cases. In contrast, you can always use more HP so you can be “tougher” as a tank. Standard end-game tank accessories provide Vitality only but no Strength. However, most tanks may prefer to have 1 to 2 pieces of accessory that doesn’t provide Vitality but provides Strength instead, which will help to generate more aggro. That sometimes comes in handy when you need that extra aggro over tankability. If you have the luxury to use the strongest crafted accessories with material melds (e.g. Platinum Ring of Fending, Platinum Earrings of Slaying etc. ), that’s an even better way to obtain both Vitality and Strength on a single accessory. However, these items are very expensive to buy and to meld. The ilevel of the strongest crafted accessories are always lower than the ones obtained by tomes. This is to ensure tome accessories not being overpowered by crafted items. Attribute points used to be very hard to change in the past. But in recent patches, they have reduced it to the cost of only 250 Grand Company Seals to reset your attributes (using the Keeper’s Hymn). So we now have a lot of freedom to modify the distributed points. Don’t worry too much about making a mistake. It can easily be fixed. - Crafted items can provide both Vitality and Strength to a tank, greatly increasing damage output and aggro while not sacrificing Vitality. A face-pull is when a tank doesn’t do crap, and just walk straight towards a target to catch its attention. It’s one of the worst things a tank can do. Face-pulling results in zero aggro on everything. Which means, the moment a DPS attack on something or the healer cast a healing spell on the tank, all mobs will run loose. The only good face-pull is when you’re trying to play a joke/prank on your friend. You can even do it as a healer or DPS! LOL! A sac-pull is when a tank sacrifices himself/herself to get aggro on all the mobs in an area in order to let the rest of the party act on a particular target without being affected by those mobs. E.g. It is common in Binding Coil of Bahamut Turn 1 for one tank to grab all adds and just run around to a far corner, while the other tank and the rest of the party act on the stone golem. This eliminates the need for the party to actually kill all those mobs to reach the golem. Before you even go in there, do yourself a favor and buy a few antidotes! Drag the icon from your inventory onto your hotbar. The antidote is to neutralize that poison at the last boss (Aiatar) if your WHM forgets to Esuna you, or if the healer is a SCH who just doesn't have Leech yet at that low level to get rid of your poison. When you arrived at the big open area, avoid the center. Go from either the left or right side. 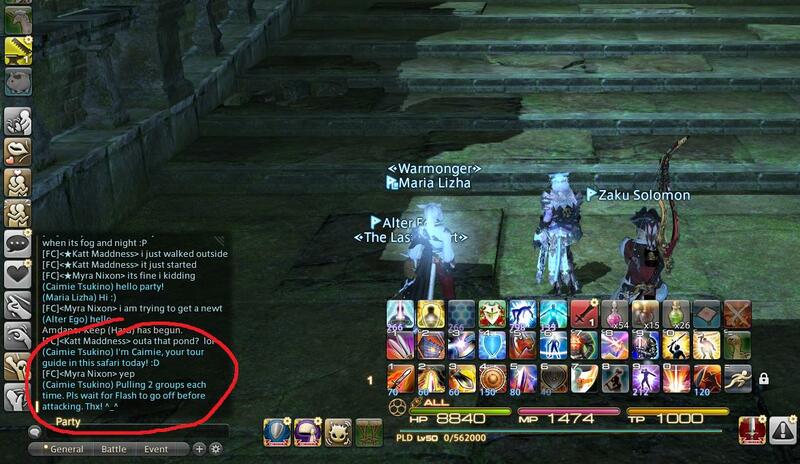 At the Drake boss, if you have a White Mage or Black Mage, ask him/her to sleep the boss when the add arrives. Then have the whole party kill the add first. If there's a melee DPS, he/she can LB the add, and the boss should just wake up after the the add is killed. 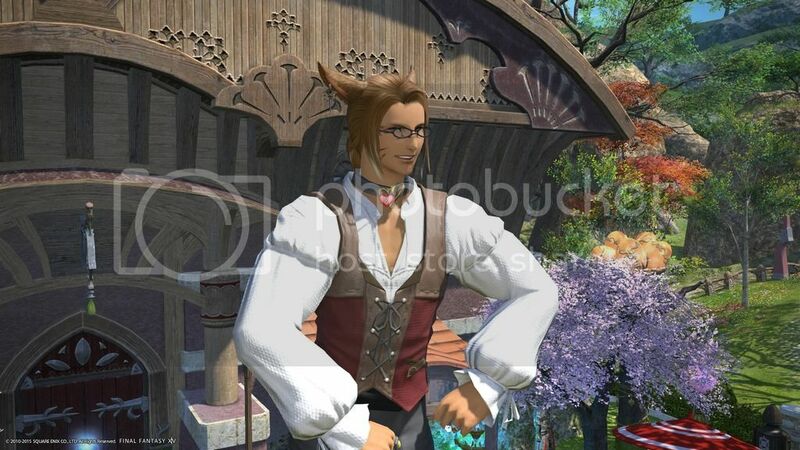 Alternatively, if you don't have LB, or if you want to save the LB, then have the WHM/BLM sleep the boss 1 more time to buy enough time to finish the add. At the Eft boss, DPS should always focus on popping out anyone trapped in the bubbles. The trapped person can also attack the bubble to help himself/herself out of it. The fight on the final boss, Aiatar, is basically a race with time. The fight must end before the healer runs out of MP. Aiatar has a lot of poison attacks. 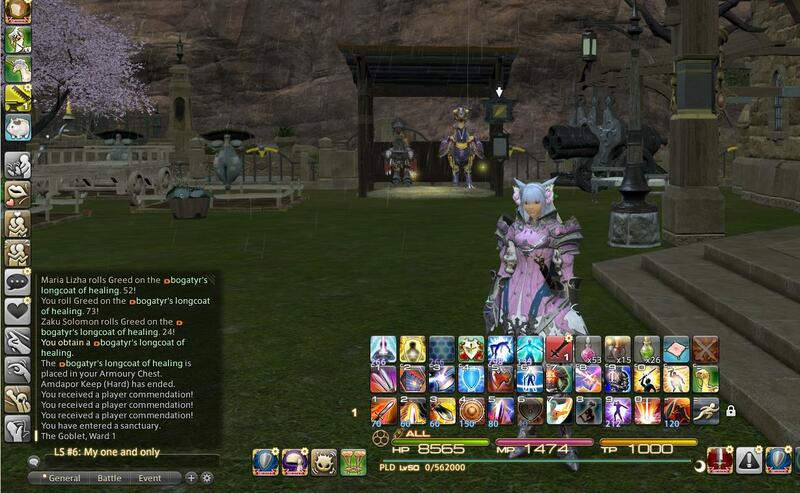 If the healer is a WHM, it helps a lot to constantly Esuna the poison status away from everybody. However, this also means a lot of MP will be used on this. If the healer is a SCH, he/she does not have Leech yet at this level, and everyone will have to live with the stacked poisons (this is where antidotes can come in handy sometimes). The SCH will have to be healing everyone while everyone is being injured by the poison, so it is also extremely MP-heavy. If the tank or DPS's get hurt too often, it will only further accelerate MP depletion. The tank should try his/her best to dodge Aiatar's frontal AoE attack to avoid unnecessary healing from the healer. Aiatar leaves many puddles of poison on the ground. The tank must always pull the dragon away from those green puddles. If Aiatar is even slightly touching the puddles, he will be healed continuously, and the fight will go on even longer. Healers should use free procs to heal whenever possible. At this level, WHM doesn't have Shrouds of Saints to replenish MP yet, so only MP potions can be used to recover some MP for the fight. SCH has Aetherflow, and that is another way to replenish MP. Bards do have Mage's Ballad at level 30. So if there's a Bard present, the mana song can be a life-saver sometimes. In AV, good tanking pretty much determines whether the run is smooth or not. Most failed AV runs are due to tank failures. Before you even go in there, do yourself a favor and buy a few spine drops! Drag the icon from your inventory onto your hotbar. The spine drops will save you if you are paralyzed by morbols or the ogre boss. (1) Right at the start, if tank grabs 3 mobs, it can already get messy. The frog's AoE is incredibly large. Any melee who try to dodge will likely end up aggroing more nearby mobs, creating a 6-mob situation with 2 frogs. Some tanks might decide to pull all 3 mobs into the cave (where you start). This will avoid aggroing more mobs, but you will lack space to dodge. The safest way, is for the tank to first grab the 2 mushrooms into the cave, and finish them first. Then grab a single frog in to the cave, and STUN him whenever he tries to do the massive AoE. (2) After that, the tank should stick to either left or right of the open area. Running through the middle is suicidal, as you will end up aggroing everything. The steam that pops up from everywhere can push you around, so it's not uncommon for people to accidentally aggro on things. Tank should pull each group of mobs backwards towards area that has been cleared. This can avoid accidental extra pulls. (3) First boss: eat your antidote every 2 stacks. (4) Second boss (the one-eyed ogre): you gotta learn about 3 attacks. "Swipe" is only a frontal attack. Tank can eat it, and still be ok. Melee dps are safe if they stick to the rear. "Swing" is a 360-degree attack and will instantly kill any melee dps. Tank has the responsibility to STUN him on every "Swing". Melee dps can do it too if he/she has a stun skill. So pay very much attention to what the ogre is casting. "Eye of the beholder" is a ranged attack that paralyzes. If you are the healer or a ranged dps, when you see him casting it, you gotta hit the "Sprint" button and run away really quick. If you are a ranged dps and got paralyzed, you may take a spine drop. If you are a WHM, you should Esuna the paralyze away from yourself or the dps, and then throw on a regen, and then continue to work on the tank. (5) there is an open area that harbors a ton of scorpions and other nasty mobs. Tank should not try to proceed by sticking to one side. Chances are that he/she or some melee dps would end up aggroing everything. Tank should pull as few mobs as possible backwards to the narrow path where you came from. It's not too hard to deal with their AoE even in that narrow area as long as the tank doesn't over-pull. (6) Last boss: eat a fruit at stack of 3. Kill adds asap. SR can be a good strategy when you need to grind a particular dungeon for a ridiculous amount. The idea is to pull as many mobs as the tank can afford, and have the DPSes AoE all the mobs at once. This way, it can shorten a 30 min dungeon to 15 min or less. As a tank, you ultimately hold the decision to SR or not. You’re also the one to determine the number of mobs you can afford to pull. (1) The first thing you do is to check on (i) the composition of your party and, (ii) the stats of each member. (i) The strategy of SR relies heavily on AoE damage. If the composition of your light party consists of 2 melee DPS, you’re probably not in a very good position to SR. Melee DPS like Monks can do very strong AoE damage, but it only lasts 10 sec, and the cooldown after that 10 sec AoE burst is 3 min before it is available again. Also, melee DPS are susceptible to AoE attacks from the mobs. When there’s a large number of enemy AoEs happening, melee DPSes cannot really engage to delivery their damage. Thirdly, when you’re running in circles to dodge the AoE from the mobs, all the mobs are turning with you, and positional DPS like Monk will be severely crippled because they cannot attack at the appropriate positions. If your party consists of BLM, SMN and/or BRD, you will be in a much better spot for a good SR. BRDs can also replenishes your MP (drained away from using Flashes) with Mana Song between each pull, making the SR even faster. (ii) SR relies much on a good healer who can keep you alive and DPSes who can kill the mobs fast. If the healer is undergeared, she/he won’t be able to heal you fast enough. If the DPSes are undergeared, they won’t be able to kill fast enough before the healer runs out of MP. (2) The second thing you do is to inform all party members that you’re going to Speed Run, so that they are all ready for it. This is very important because even the best healer will not be able to keep up if they didn’t know you’re going to mass-pull. So you gotta get everyone’s consent. You should also tell them how many groups of mobs you plan to pull each time, or where you plan to stop, e.g. “I’m going to pull 2 groups each time… 6 mobs total!”, “I’m going to pull all the way to the end until the door – grabbing all 9 mobs!” etc. (3) Unlike a normal pull, you don’t pop your defensive buffs before the pull. You want to activate them when you’re NEAR the engagement location. You can mark the first few mobs if you want, but it’s not necessary since it’s going to be AoE strategy – you will not be focusing on any of them. So just start running to the 1st group of mobs, Shield Lob one, Flash once to establish some aggro on the rest, and then keep running (so that some impatient DPS won’t grab aggro too fast with an arrow or two, and so that if the anxious healer wrongly throws a regen at you too early, she/he won’t immediately get attacked), then avoiding injury from the 1st group, proceed to the 2nd group. Do the same on each group until you’re NEAR the engagement point. Then activate your defensive buff(s). If you’re pulling 3 groups or more (i.e. 9 mobs), it is necessary to activate Hallowed Ground (or at least Sentinel). This allows you to survive 10 seconds before the healer sets foot at the right spot, pops her/her healing buffs, and start healing you. (4) Spam Flash & Circle of Scorn like mad while dodging the incoming AoE from the mobs. This establishes AoE aggro on everything you pulled. DO NOT use the Halone combo. If you waste too much time on Halone combo on a single mob, you will lose aggro on the rest. (5) After the 10 sec of Hallowed Ground or Sentinel (you don't need these for 6 mobs, Hallowed Ground only needed for 9 mobs or more), you gotta continue popping more off-GCD defensive buffs one after another. If you need more buffs, pop’em at will. (6) Pay attention to the enemy list on the left of your screen, and look for any mob that does not have the “red” logo. If there is a long-range caster within the mobs, chances are that your Flashes may not hit it, and it may start attacking the healer. In this case, click on that mob on the enemy list, run forward while hitting "Shield Lob". You will automatically be facing towards it, and it allows you to locate the mob. Since you're already targeting it, run straight to it, and continue your Flashing. If it's already deeply attracted to the healer, use Provoke, and continue Flashing. (7) If you think your aggro is high enough on all the mobs, you can stop the Flashes. This will save the remaining MP for the next pull. But if there’s a strong BLM there doing much AoE, and you’re afraid you might lose aggro, then continue Flashing until you run out of MP. (9) After each big pull, you want to give the party a little time to recover. Everybody needs some time for the off-GCD buffs to be available again. Communicate with the party before your next big pull. - Getting all 3 commendations after a successful speed run. At lower levels, GLA/PLD is really difficult to play due to the lack of AoE skills (especially before acquiring Rage of Halone at lvl 26). Most GLA can't keep aggro over 3 mobs in dungeons, resulting in 2 loose mobs attacking healers and DPS. Most GLA don't utilize "Flash" too well. Although, "Flash" has been buffed, and it's easier now. In contrast, low level MRD/WAR is relatively easier to play due to the early availability of "Overpower". The keeping of aggro over multiple targets is relatively easy. Post-lvl 50, PLD is all about damage mitigation. It doesn't have as much HP pool as WAR, but its defense stats is much higher due to having a shield. (2) "Fast Blade -> Riot Blade" combo. The Halone combo maximizes aggro generation on a single target (especially in combination with Fight or Flight). The Riot Blade combo gives almost no aggro, and is only useful for MP recovery. Thus, PLD usually just stick to combo #1. Combo #2 is rarely used in high level raids. PLD has many, many, many off-GCD skills for damage mitigation / HP recovery, like Rampart, Foresight (crossed from MRD), Bloodbath (crossed from MRD), Bulwark, Sentinel, Awareness, Convalescence, and the ultimate Hallowed Ground (Tempered Will doesn't help with mitigation or HP, but helps maintain position or shake off effects like slow from Morbols). Each of these can last from 10 to 30 seconds. A PLD can pop these skills one after another (or sometimes 2 at once, if situation is dire), and she/he will be tough like a rock. Since PLD can never do much damage anyway, there's only 1 build for PLD - the Vitality build. You can have slightly more Strength to increase damage and help with aggro, but the amount of damage that a PLD can do is still very limited. If you put all your attribute points into Strength, and even use all accessories that provide Strength instead of Vitality, then you will be able to hit strong, but you become paper thin. This is NOT what you want as a tank, especially main-tank, which most PLD will take the role of. In this sense, post-50 PLD is actually relatively easy to play comparing to WAR. PLD is simpler. It's rock solid. It's safe. It gives relatively less burden to healers too, because it suffers less damage than WAR. Post-lvl50, WAR splits into the Vitality build and the Strength build. Vitality build is all about eating that incoming damage with a massive HP pool. This build creates a massive meat shield that can tank as good as a PLD, but since it suffers massive injuries, it is quite a burden to healers. Strength build has less HP to buffer injuries, and is all about generating more DPS to result in higher HP recovery. This build requires the WAR to know the mechanics very, very well. The WAR has to pop specific combination of skills at the right time to boost that HP recovery as well as that damage mitigation. (3) "Heavy Swing -> Maim -> Storm's Eye" combo. (1) is a WAR's most reliable, solid aggro generation combo on a single target. (2) increases damage (which will also help with aggro later), recovery HP and reduce injury. (3) increases damage (which will also help with aggro later), and reduces target's HP recovery and slashing resistance (which will also help with damage and aggro). Unlike PLD, WAR actually needs to alternate between these combo. WAR has Foresight & Bloodbath (off-GCD skills), which are kind of the bread and butter for basic damage mitigation and HP recovery. Unchained, Inner Beast, Steel Cyclone, Berserk, Vengeance, and Infuriate. Unchained, Inner Beast and Steel Cyclone can only be activated under "Infuriated" status. Berserk and Vengeance are off-GCDs that can be popped any time. Infuriate grants the Infuriated status immediately. In addition, WAR has Fracture as a DoT skill, which allows even more DPS to be done. PLD, in contrast, is much easier to handle. If you know the strong attack is coming, you just click 1 or 2 buttons for defensive buffs, and you're fine, and even the shortest buffs like Hallowed Ground and Sentinel can last for 10 sec. So there's more room in the timing for error than WAR. Strength build WAR is risky on the sense that you don't have much room for mistakes - or you just die because you don't have as much HP pool and you don't have PLD's damage mitigation. But if you play a Strength build well, not only will you be doing massive damage (reducing the burden of DPS's), you will also be recovering much more HP than a Vitality build, thus reducing the burden of healers to spend as much MP on healing you. The result is the healer will have much more MP to heal the rest of the party, keeping some DPS alive, which may ultimately determine the win or loss of a raid. 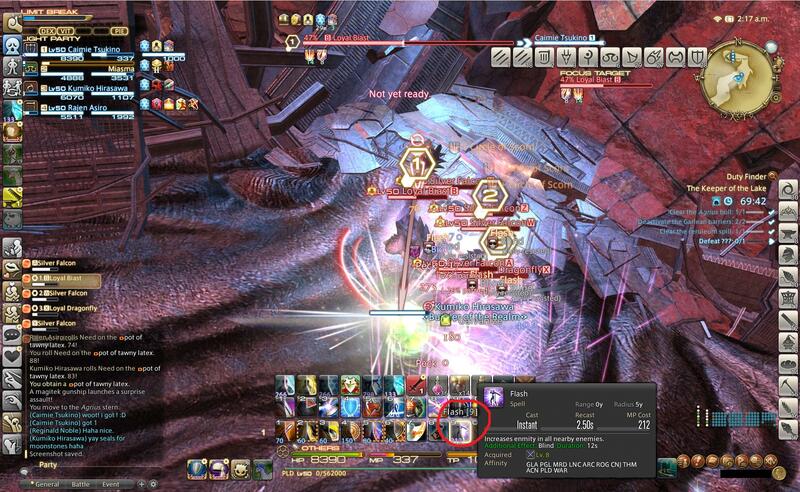 In some cases, you can even substitute a DPS in the party with a third healer, creating more flexibility. A Vitality build WAR is fine too. It can't do as much damage as a Strength build WAR, but it can still use exactly the same skills/rotations as a Strength build WAR to do DPS, damage mitigation and HP recovery. It can't hit as hard or recover as much HP. But it has a much larger HP pool to buffer damage. In fact, the effect of "Thrill of Battle" is much stronger for a Vitality build WAR than a Strength build WAR. In a dire situation, it can be a life-saver. Imperatrix Echidna, Somarlane, Jinzuku and 4 others like this.